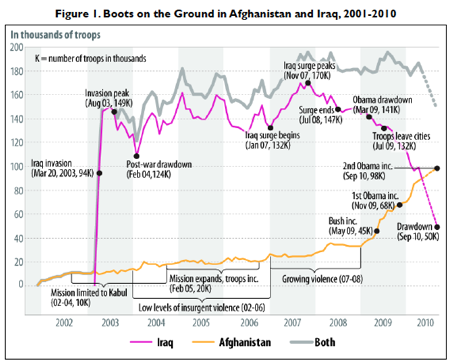 Amid the celebration today, a sobering note from a recent congressional study: Since Osama bin Laden's organization launched the Sept. 11 attacks, Congress has appropriated $1.3 trillion on wars, extra security measures and veterans' healthcare. The March 2011 Congressional Research Service study (.pdf), flagged by Sam Stein, found Congress has OKed "$1.283 trillion for military operations, base security, reconstruction, foreign aid, embassy costs, and veterans’ health care for the three operations initiated since the 9/11 attacks" -- Iraq, Afghanistan and the initiative to secure military bases. The lion's share of that has gone to the Iraq war, which, of course, was justified in part on the basis of a nonexistent connection to al-Qaida and bin Laden. DOD war costs reflect incremental war costs, in other words, costs that are in addition to regular military salaries, training and support activities, and weapons procurement, RDT&E or military construction as described above, as well as new war-related programs such as coalition support or the Commanders Emergency Response Program designed to meet specific war needs. There is no question that the Iraq war added substantially to the federal debt. This was the first time in American history that the government cut taxes as it went to war. The result: a war completely funded by borrowing. U.S. debt soared from $6.4 trillion in March 2003 to $10 trillion in 2008 (before the financial crisis); at least a quarter of that increase is directly attributable to the war. And that doesn't include future health care and disability payments for veterans, which will add another half-trillion dollars to the debt.